Never Enough Nails: Lynnderella Friday, Vol. 61!! Happy Friday everyone!! Our huge regional championship competition starts today, so I will not be having a relaxing Friday and weekend, but I hope you do! I have two new beautiful Lynnderellas for you, so let's start off with Lynnderella Shy Pink Periwinkle. Lynnderella describes this as a "rich periwinkle shimmerella with pink, lilac and blue multishimmer". It is a gorgeous deep periwinkle, almost approaching a cornflower blue with a wave of pink shimmer. The pink shimmer is more prominent in person than in these pictures, especially in certain lighting conditions. Love this! This is two easy coats. The formula is really great- nice and opaque, goes on smoothly, and perfect consistency. 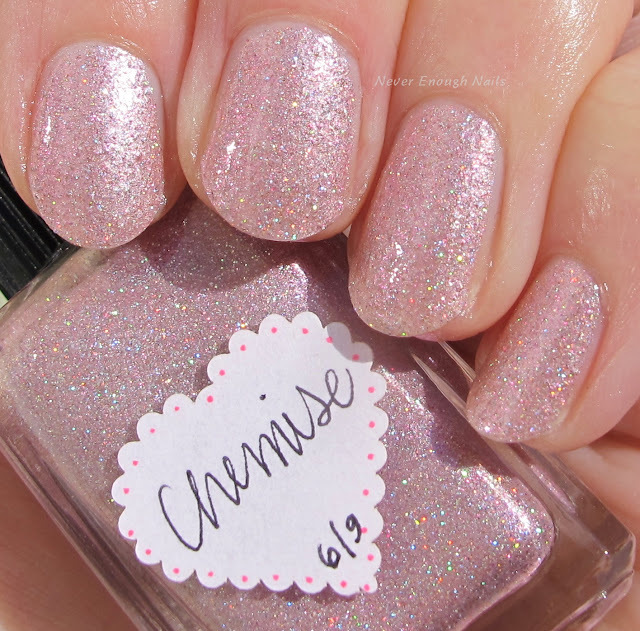 This ladylike gem is Lynnderella Chemise, a "dainty pink shimmerella accented with a whisper of holographic nano glitter". 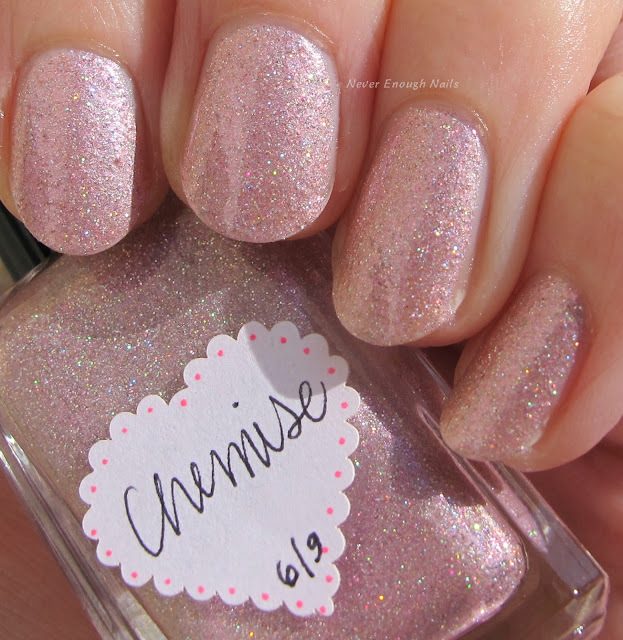 This is a lovely soft shade of blush pink with tiny holo sparks laced throughout the polish. 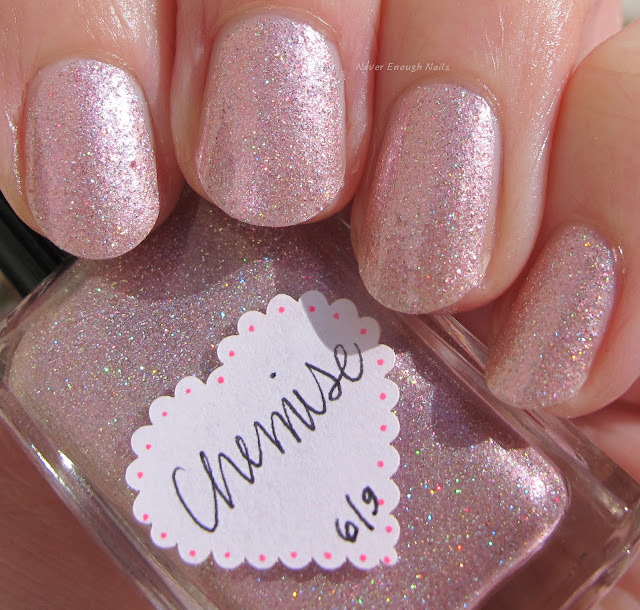 Just enough holo to add some sass to a delicate color! This is also two easy coats! Great coverage and formula. Because the holo glitter is the nano size, it is smooth to the touch with one layer of top coat, not at all bumpy or gritty. Lynnderella Shy Pink Periwink and Chemise are both available on http://stores.ebay.com/lynnderella-lynnderella. For more Lynnderella choices, check out lynnderella.com.